Don’t want to read the entire PriceLabs review? I offer Airbnb revenue management to hosts with 5+ listings. I use PriceLabs for my Airbnb listings, the revenue managed listings, and the Airbnb property managed listings. This should come as no surprise to you. The few reviews I have written (Payfully and Smartbnb) are because I use and value the services. I routinely monitor and test all major players and smaller companies I find or are brought to my attention. 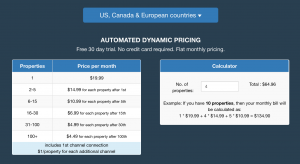 Cost — PriceLabs charges a flat fee rather than a percentage. I prefer this because whether my reservation is for $100 or $1000, the software is doing the same amount of work. PriceLabs will be the cheapest option for anyone with 70%+ occupancy and a daily rate of about $75 or more. As you use PriceLabs for more than one listing, the cost per listing drops. Notice the below prices are for Airbnb hosts in US, Canada, and European countries. If you are not in one of those categories, you will pay slightly less. Daily Rates — PriceLabs varies the daily prices more than the others. You may or may not prefer this. I prefer it. The nearer unbooked dates go lower and the further out unbooked dates go high (typically) than the other services. Customization — The customizations alone pay back the monthly fee. However, you need to set time aside to learn the intricacies. My PriceLabs review will help. Support — Email only, however, I have found the wait time is minimal. As far as I can remember they have responded same day within a few hours every time I have had to send an email. Listing Id — Displays the Airbnb unique number with a link to the online listing. Red means it is unlisted on Airbnb; green means listed. Listing Name — Shows listing title, platform being used, and email address associated with the listing. Customization Group — Allows you to apply standard customizations (we will talk about these below) to a group of listings rather than applying and changing them individually. PriceLabs has written a lengthier version of this feature. Tags — Allows for better sorting. For example, if you have listings in different cities, you can identify them here. Min — Your minimum acceptable nightly price. General advice: Your minimum is probably too high so lower it by 15% right now. Specific Advice: A minimum typically only comes into play during the slow season and in the next 7–10 days if unbooked. If you are doing things right, rarely will a guest book at your minimum price. A minimum price is not what you would like to get, it is the minimum amount you will take at a moments notice to get your place booked if the alternative is to keep it vacant. Base — Your base price is what you would expect on an average night in an average month. Either go with PriceLabs suggested base price (which is usually pretty accurate) or take a guess. Regardless, you will have to monitor and adjust your base price throughout the year as booking trends change. Max — Maximum rate you are willing to charge a guest per night. You can leave this blank. Last Synced — The last time PriceLabs synced with your chosen platform. If this is more than 24 hours, something is off. 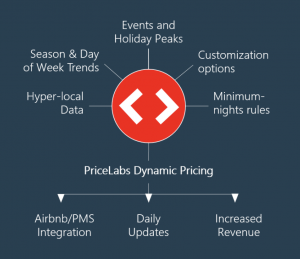 Sync Prices — Whether or not you want to turn on the automatic daily sync between PriceLabs and your chosen vacation rental platform or management system. Once you start syncing prices, your old rates will be overwritten with the new PriceLabs recommendations. 7/30/60 day — Represents percentage of days open in the next 7, 30, and 60 days, respectively. The other services show the percentage of days booked so this is something you will have to adjust to had you been using a different service. High numbers bad, low numbers good. Review Prices — This green button is where the magic happens and takes you to each individual Airbnb calendar where you have more customizations available to you. Note: If you make any changes to the ‘Lowest’, ‘Base’, or ‘Highest’ you need to click ‘Save/Refresh’. If you make changes to the calendar directly, like changing a price, you do not need to click ‘Save/Refresh’. A common complaint of an Airbnb host using another third-party pricing tool is that they do not have enough control over last minute discounts. PriceLabs fixed this. You have three options: Fixed, % — Flat, or % — Gradual. % — Flat — Applies a flat percentage discount (decrease) to the suggested rate over the next X days, but not below the specified minimum (ie Apply a flat 50% discount to the recommended rate over the next 10 days). You can also select ‘Increment’ which will raise your prices. % — Gradual — Applies a gradual percentage discount (decrease) to the suggested rate over the next X days, but not below the specified minimum (ie Apply a gradual 50% discount to the recommended rate over the next 10 days but not below my set minimum). In the example, the discount would be 50% on day 1, 45% on day 2, 40% on day 3 until it reached 5% on day 10. If you had changed the number of days to 5, then the percentage discount would be 50% on day 1, 40% on day 2, etc. You can also select ‘Increment’ which will raise your prices on these days. Fixed — Simply input a fixed price you want your orphan nights to be priced at and define an orphan night. 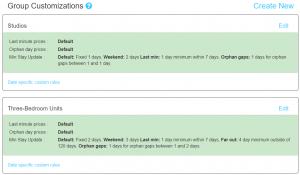 The photo below tells the software to apply a rate of $95 to any orphan night defined as any gap of 2 days or less. This rule would be for a host with a minimum stay requirement of 3 nights. Percentage — Similar to fixed except you enter a percentage increase (increment) or decrease (discount) which works off the recommended price. For example, if the original recommended price on an orphan night is $100 and you set a 25% increase on orphan nights, the new price would be $125. This one is a bit complicated but powerful. I will explain it as simply as I can. PriceLabs has written a detailed explanation of their minimum night customizations for your viewing pleasure. None — No minimum night adjustments will be made to your Airbnb account, but you can still work with the remaining three customizations. Fixed — You will probably use this option. The first box represents your general minimum (in number of days) to be applied to all days. The second box (ie on the right side) represents a minimum you want to set on the weekends. Note when setting a weekend minimum that a weekend is defined as either a Friday or Saturday in the reservation. For example, if you require a 3-night minimum on weekends, this could include any combination of the following reservations: W/Th/Fri, Th/Fi/Sa, Fr/Sa/Su, or Sa/Su/Mo. Booking Value — This is only to be used if you want a minimum total dollar amount per reservation. PriceLabs will adjust your minimum nights requirements to accommodate the number. BEWARE! If you do this, depending on your area and your listing settings, you will want to raise the price of this vacancy. A last-minute reservation is higher risk than one made in advance. Think about it, most partiers and thieves are not planning 30 days in advance. If you need help identifying problem Airbnb guests in advance, then read my article. Length of gap — This allows for a dynamic minimum night requirement depending on the length of the gap. For example, the screenshot below tells the system to make the minimum night requirement equal to the gap of unbooked days as long as the gap is either 1 or 2 nights. This would be a suitable setting for an Airbnb listing with a 3-night minimum (ie potential for 1 and 2 orphan night days between bookings). Is this clear? If not, let me know in the comments and I will explain further. Account Level Customizations — You can create any of the customizations we talked about above once and apply them to all of your listings with this feature. Group Customizations — If you have two or more distinct groups of Airbnb listings where an entire account customization would not work, then you will want to create a group. This would be used in any case where you want to apply different customizations to different listings for any reason. Listing level customizations — This is your one stop shop to adjust any customization on any specific listing rather than having to first click the ‘Review Prices’ button on the main dashboard for each listing you want to edit. PMS — Lets you know which vacation rental system the listing is connected to. They list Airbnb as a PMS which it is not (it’s a vacation rental platform like VRBO), but it still will be found in this section as it is treated the same. Customization Group — If you created a ‘Group Customization’ in the ‘Customization’ dashboard, here is where you can group the listings associated to any group. Tags — Another option to group listings as you see fit with text descriptions. Low/Base/Highest Price — If you had pricing adjustments to make to the minimums, base, or high price on numerous listings you could do that here without having to click into each individual listing. Map Listing — Useful for users who integrate their PMS with PriceLabs. Some PMS systems do not integrate with Airbnb, so in that case the map functionality lets PriceLabs know which PMS listing corresponds to which Airbnb listing so that 1) they can maintain price parity and 2) they do not double charge because it is the same listing just listed in multiple places. The extra channel costs $1 per channel. 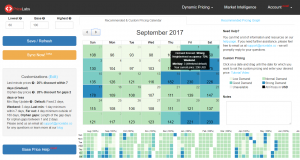 If you use a PMS, this becomes your main calendar and you should integrate your pricing through your PMS rather than Airbnb. Show prior days action — In an individual listings calendar, past days are simply greyed out. I would like to see whether or not a particular past day was booked or not and at what price. This helps me figure out if my minimum pricing is accurate. ‘Save/Refresh’ loading stall — When you adjust something on the calendar and click ‘Save/Refresh’ there is a loading lag. It is only a few seconds, but it can add up if you have 30+ listings. The ‘Sync Now’ button does not do this. ‘Review Prices’ dashboard window adjustment — I would like to be able to adjust the top window that shows all of your listings. When you have more than ~12 listings in the system, it takes up the entire screen and you have to scroll down to the listing calendar each time. Show occupancy rates in calendar view — I find myself scrolling up to view the occupancy rates for a particular listing when I am looking at the calendar. Assign color values to occupancy — On the main dashboard, I would love to assign color values to the occupancy rates rather than being stuck with the current system choices. Average Daily Rate comparison — ADR is a hotel-industry metric, but it tells you directly how you are doing by taking into consideration the rates you booked at and your unbooked days in a given month. Booked vs blocked future dates — I would like to know whether a future greyed out day is blocked or booked. Right now, I have to log in to Airbnb for this information. I love PriceLabs because of the variety of customizations allowed, the low fixed price point, and, of course, the daily rates. I also love that it is available globally and have recommend it to many of the hosts I have worked with.